When using the bolts to force the housing off, do it very carefully, half a turn at a time. Make sure it is coming off evenly and not jamming the turbine wheel. 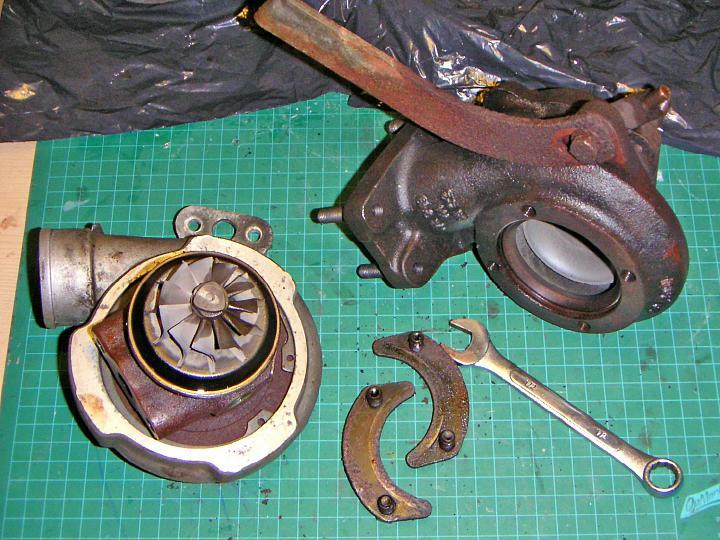 This Garrett T25 turbo is found on 1991-1998 Saab 9000, 1994-1998 Saab 900 and 1999 Saab 9-3. There are certain differences between the models, but the cores are almost identical, so you might find this useful even if your unit is somehow different from those pictured. The goal of this job was to rebuild a turbocharger using new seals and bearings from a service kit.